Kidou Senshi Z-Gundam: Hot Scramble (translated: Mobile Suit Z-Gundam: Hot Scramble) is a game developed for the Famicom console by Bandai and was released in 1986. It is based on the first Gundam sequel series, Mobile Suit Zeta Gundam. The game was designed by Masanobu Endoh, developer of such titles as Xevious and The Tower of Druaga. It was initially conceived of as being presented entirely in a first person perspective. However, the decision was made that the game needed more; and a third side-scrolling platformer portion, very reminiscent of Thexder, was added to the game. Response to the first-person perspective portions of the game was quite high, while response to the tacked on platformer section was low. As a result, Bandai released Kidou Senshi Z-Gundam: Hot Scramble - Final Version. This golden Famicom cartridge, limited to 1000 units, had the side-scrolling segments entirely removed from the game, and was thus truer to Endoh's original design. It's understandable why Bandai decided to add the side-scrolling segments to the game: a first person game where you can't actually see the Z-Gundam in action (not to mention transforming into the Waverider), would have been of little appeal to Gundam fans. It was actually the very first console game based on Gundam, although many more have been made since, few to high acclaim. While it is the first of many Gundam games developed for a console, it was preceded by numerous home computer versions. The Famicom version was converted for play on the Game Boy Advance and released in Japan in 2004 as an unofficial inclusion to the Famicom Mini series of games. The opening music is a midi version of Zeta - Toki wo Koete, the series first opening theme, and the in game music is a looping midi of Mizu no Hoshi e Ai wo Komete, the second opening theme. Seven years have passed since the One-year War between the Federal Earth Government and the Zion Dukedom ended. But the computer system was destroyed in that war and the federation army register was lost. Colonel Char Aznable of the Zion forces infiltrates into the federation army under the pseudonym of captain Quatro Bagina. He has also become the leading figure of the Anti-Government Organization A.E.U.G. that insist the mankind should emigrate to space if they wish for the perpetuity of earth. But the Federal Force TITANS put pressure on them. The story began at Side 7. your mission is strike TITANS and AXIS. Good luck. The player takes the role of Kamille Bidan, the pilot of the title mobile suit Z-Gundam. Each stage of the game is broken into three parts. The first two parts are presented in the style of a first person shooter, first on earth, then in space. 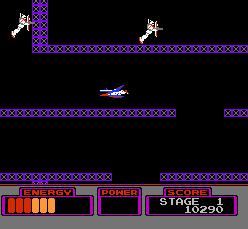 The third part is a platformer section through an enemy base, in which the Z-Gundam can transform from a robot to a fighter jet, and can collect power-ups. The stage concludes when the player locates and destroys the core of the base. 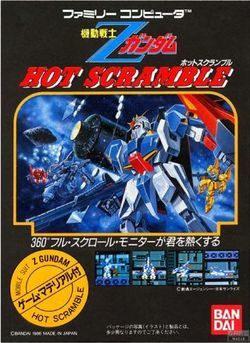 Hot Scramble consists of 25 primary levels, with enemy mobile suits appearing in an order which roughly corresponds to their chronological appearance in the Zeta Gundam television series. After the 25th level is beaten, the game loops endlessly through the last 8 levels of the game. At certain stages, Mobile Suits such as the Psyco Gundam, Psyco Gundam MkII, Palace Athena, or Qubeley will appear and must be destroyed (with one shot, unlike the bosses which take multiple hits) for the player to advance further in the stage. Each stage is split into three parts. The first one puts you in the cockput of the Waverider on the Earth's surface, shooting any mobile suit that approaches. The action is in first person and accomplishes a sense of speed via a checkered background. The zooming and scalino effects for enemy sprite is commendable, considering that it's an early Famicom game. You must aim your lock-on at enemies and fire in an effort to destroy them. You may shoot at an enemy's projectile as well, in order to prevent taking damage. On the ground, turrets will try to shoot you down: you can destroy them as well. The Waverider has a good degree of maneuverability (and a generous energy bar), and can even accelerate by pressing . 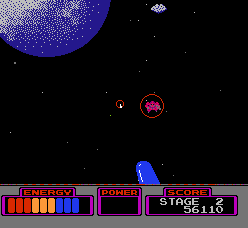 When you've taken down a set amount of enemies (increasing in number as you progress further in the game), you'll take off from the Earth's surface and into outer space. Here, you'll have to fight large amounts of Mobile Suits that come from any direction: above, below, or behind you. The game basically plays the same as before, you can still speed up in open space in hopes of avoiding enemy bullets. Yet, it successfully manages to give the illusion of 360 degrees of freedom which is claimed on the box. The level of difficulty intensifies due to the different mechs that you face as you advance through the stages. Once you survive the mech swarm in open space, you'll be brought inside the enemy base. It may be inside a Side Colony or inside an enemy ship, in which case you must disable it first. The game switches to third person and becomes a scrolling platformer. You now control your Zeta Gundam in mech form. The mobile suit's jumping ability is very limited. To navigate the maze, you must transform into a Waverider again by holding down . Controlling the Waverider in these narrow corridors is difficult, especially since it remains in constant motion and can't stand still. The Z Gundam can shoot in eight directions, and can destroy most enemy mobile suits with one shot. The objective of these sections is to find energy tanks to replenish your life, gather any available power-ups, and finally locate and destroy the Core Reactor to end the stage. While fighting the Core, it sprays projectiles in every direction whenever you successfully fire at it. In order to destroy the Core and avoid its return fire, you'll need to transform into the Waverider and fly inside the small enclosure. Power-ups can only be located and collected in the side-scrolling portions of the game. Energy Collecting this secret pack can restore lost energy to the Z-Gundam. Power Rifle The rifle upgrades your normal weapon in the following ways: The rifle's beam will continue to travel through struck enemies, beam barriers can be destroyed, and the rifle can destroy a Reactor Core with only four shots. Power Shield The power shield can defend the Z-Gundam from several enemy attacks, but from only one return fire of the Reactor Core. This page was last edited on 25 April 2009, at 10:52.